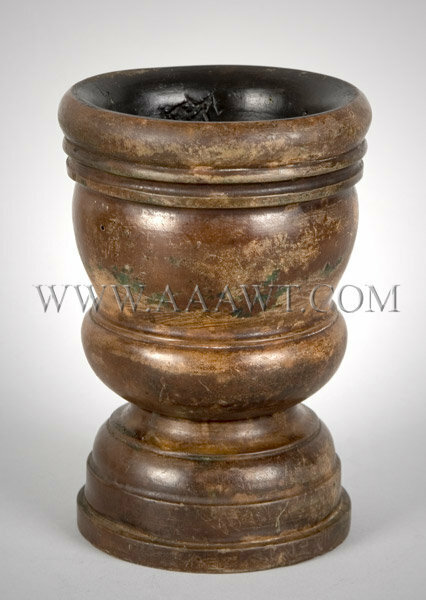 Typically, tall and elegant featuring concentric incised rings and finely combed decoration. 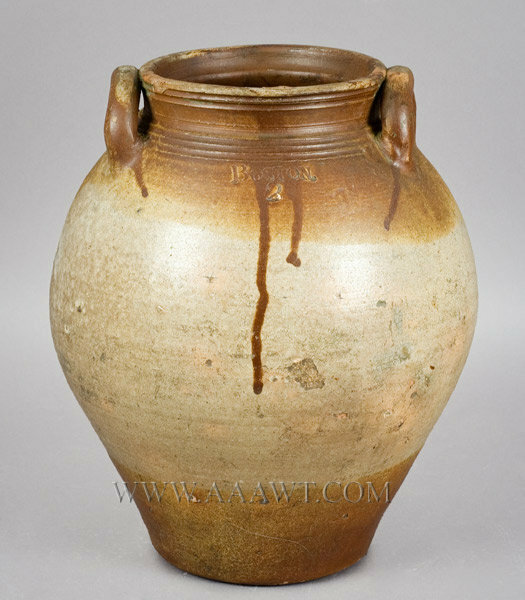 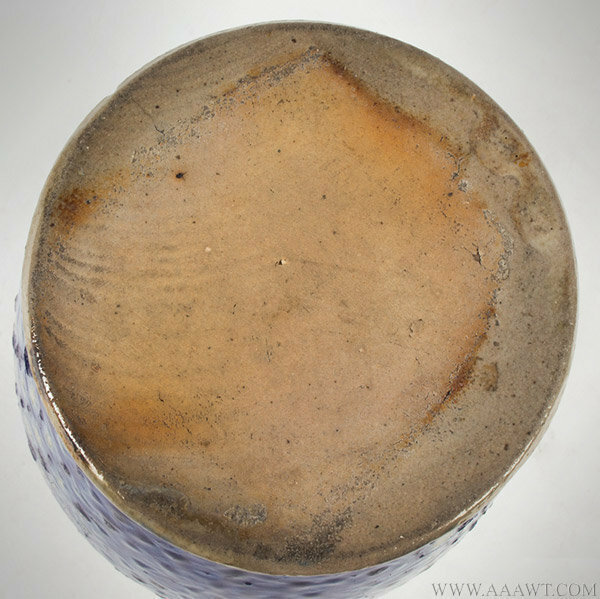 (Fine original condition: Height: 11.5": overall height: 12.75") See pages 162 and 163 of Early Stoneware Steins from the Les Paul Collection, number 64. 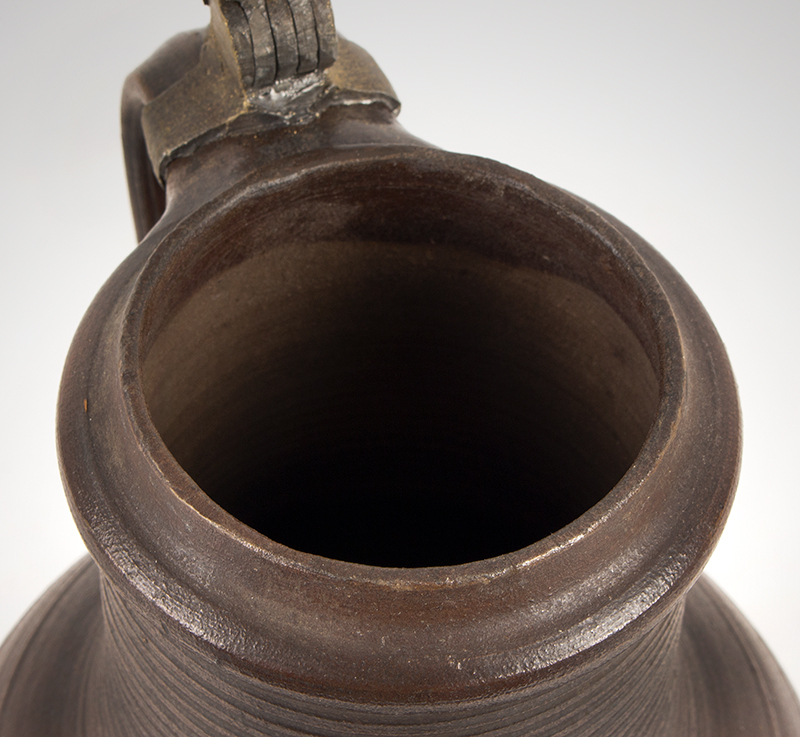 Thomas Commeraw was one of the earliest African-American master craftsmen to operate his own business in the United States. 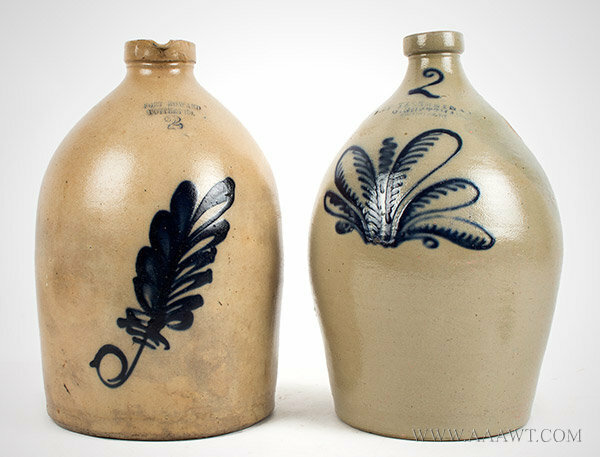 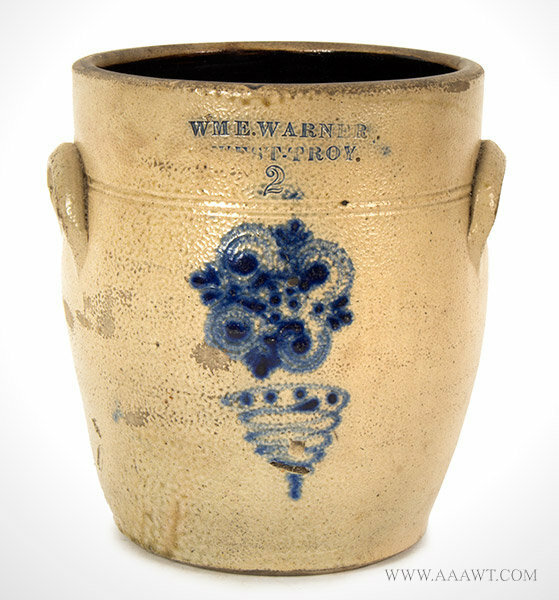 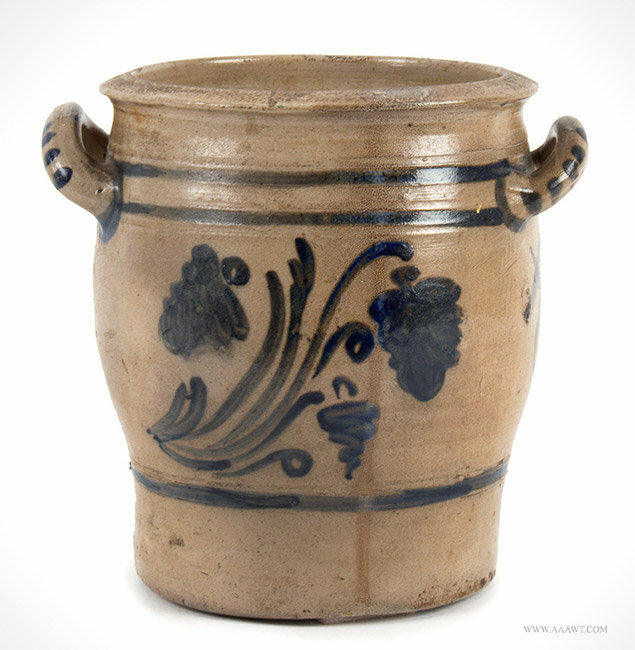 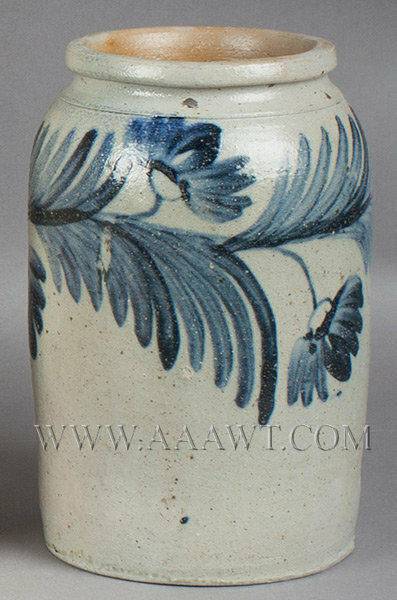 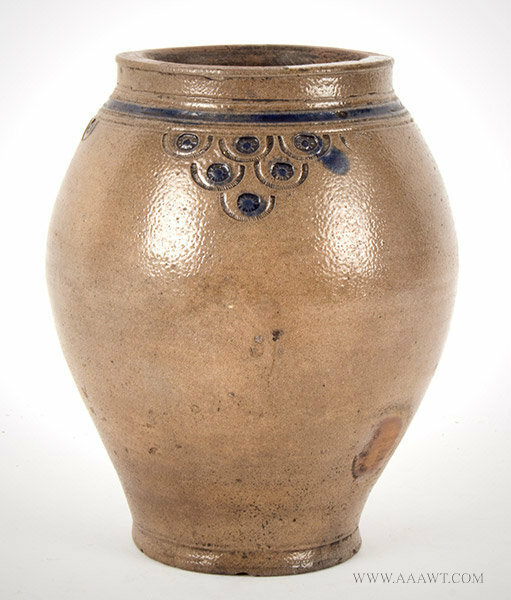 Thomas Commeraw, a free black potter established his pottery in the Corlears Hook neighborhood of lower Manhattan in 1797, successfully competing with well-known established stoneware makers including the Crolious and Remmey dynasties. 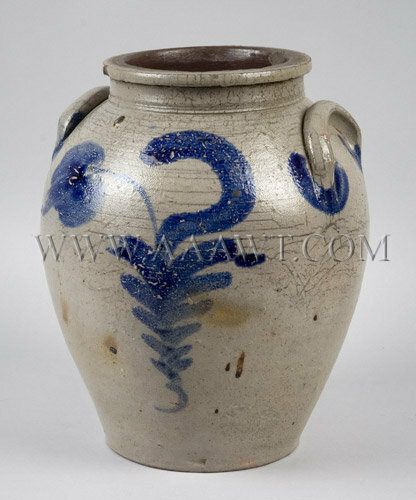 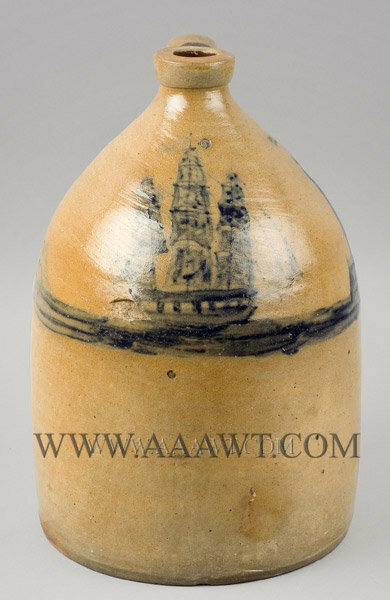 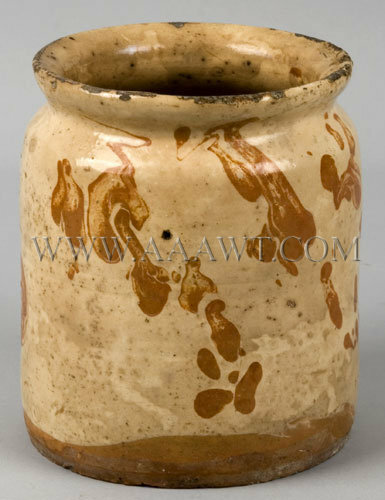 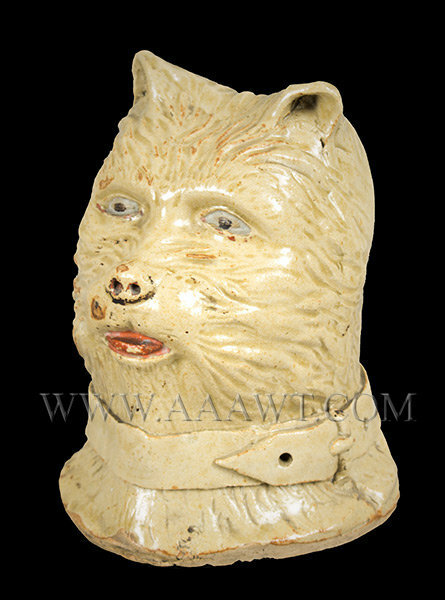 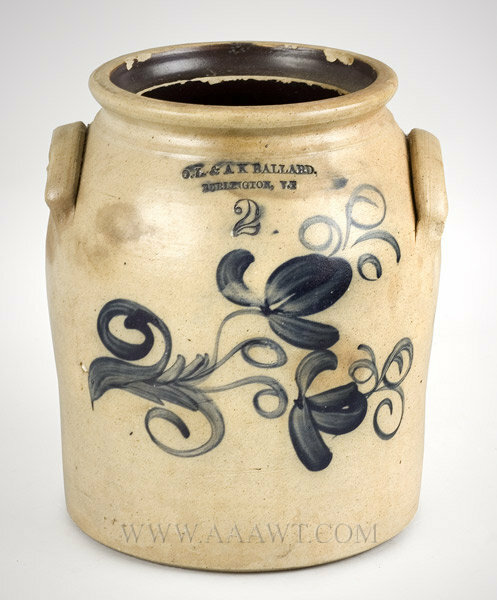 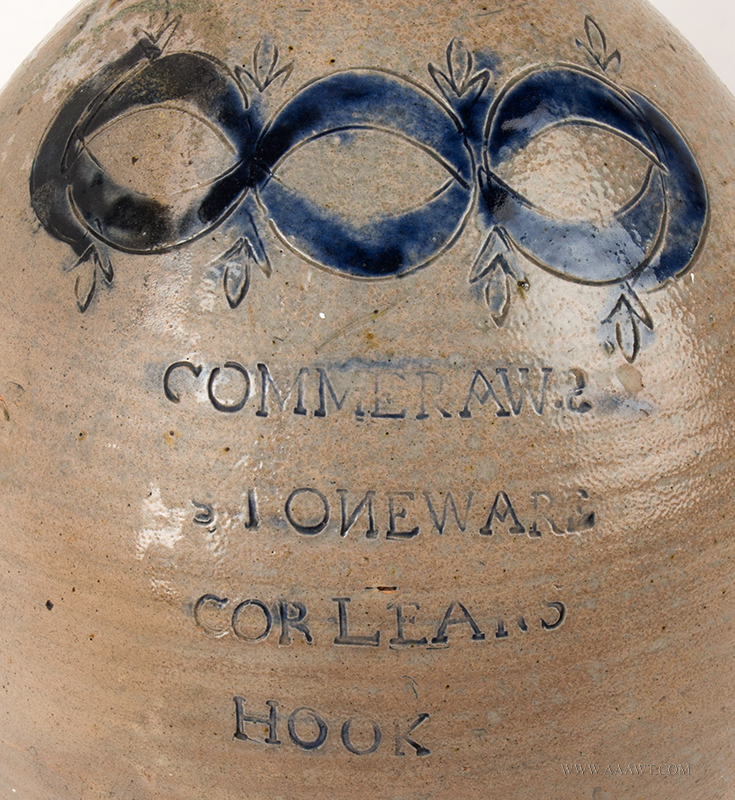 This piece was made early in the production of Commeraw’ s stamp-decorated wares. 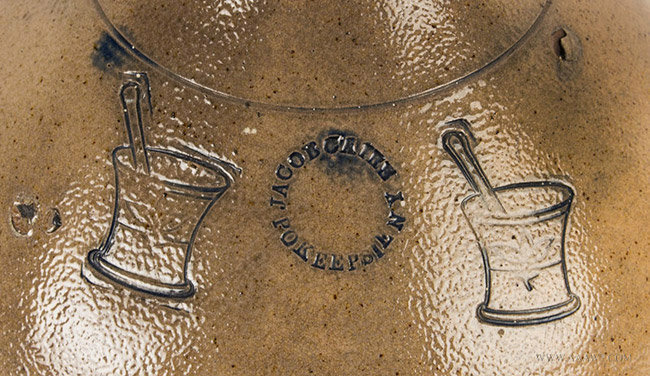 His work was masterfully-competent; the vocabulary of ornamentation displayed indicates that the potter’ s ability and understanding of craft rivaled that of his contemporaries… proportion, decoration, and utility combined. 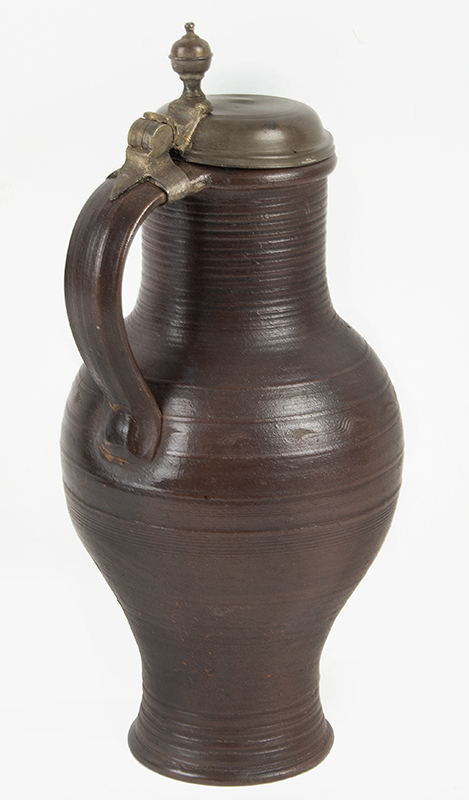 Obviously skillfully-potted using fine clay, brushed and highlighted with cobalt slip… a robust jug with rounded foot, tooled spout, and ribbed handle; the shoulder wide enough to display the sharply impressed cobalt-highlighted drape-and-tassel motif within crescent ends centering cobalt-highlighted maker's mark…displayed is: "COMMERAW.S STONEWARE" impressed in two lines; note the reversed and smaller “S” …all above “CORLEARS HOOK”. 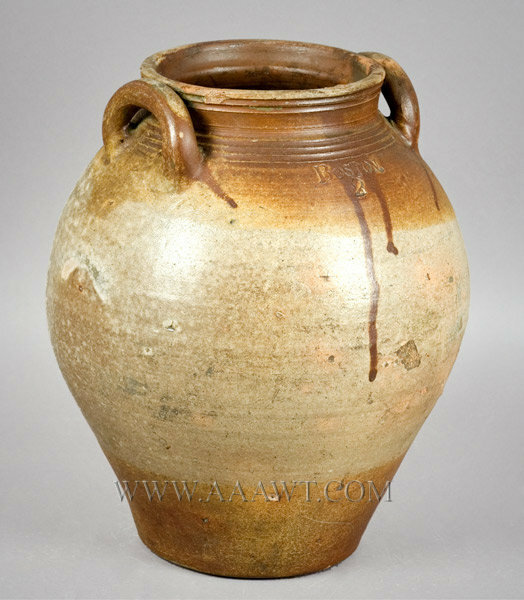 Tooled and incised neck with lug handles, impressed "BOSTON over 2", brown glaze. 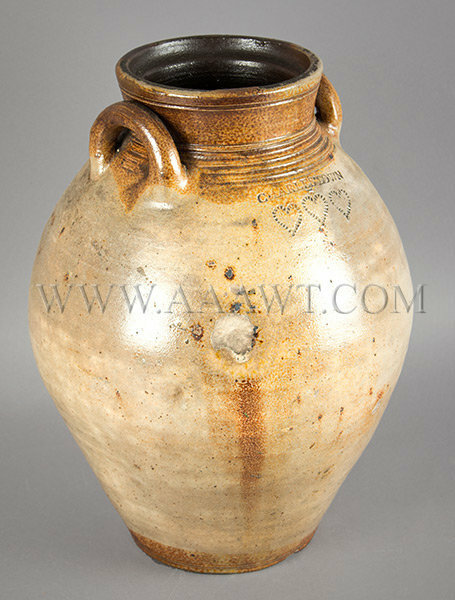 In generally excellent condition considering age and working life. 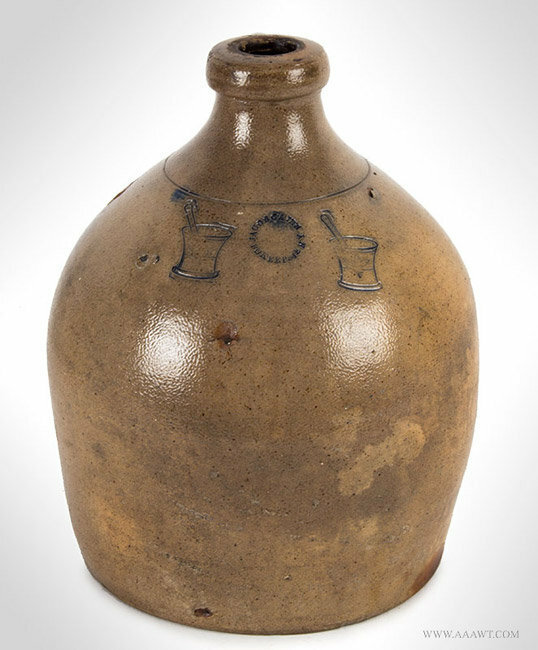 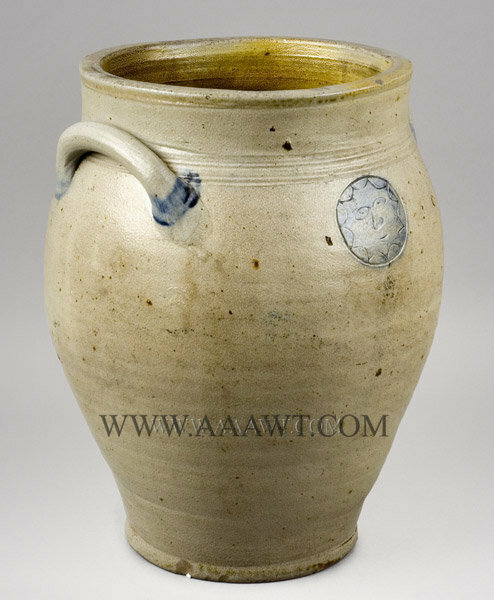 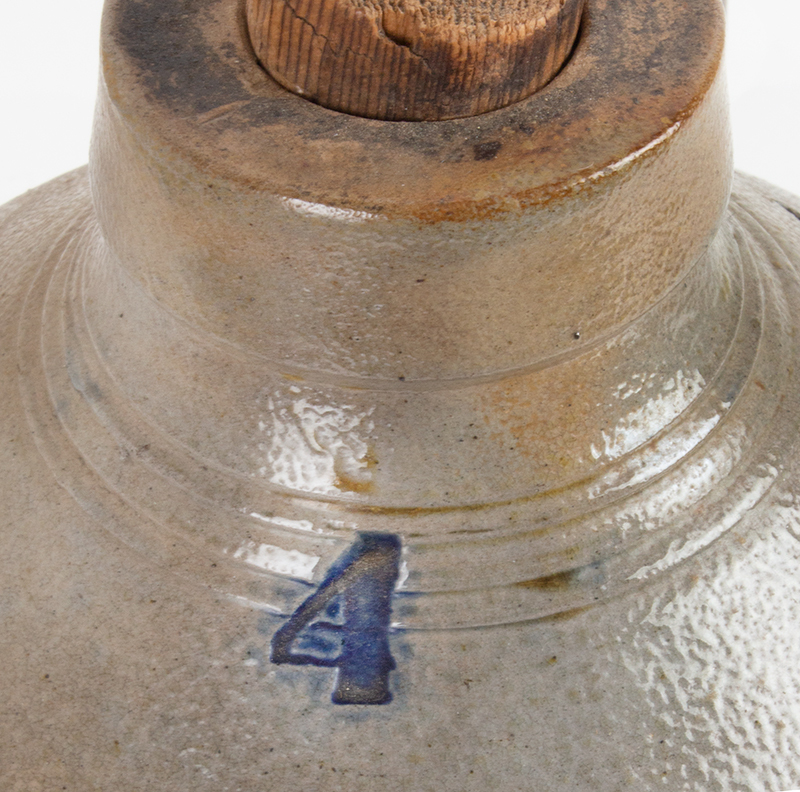 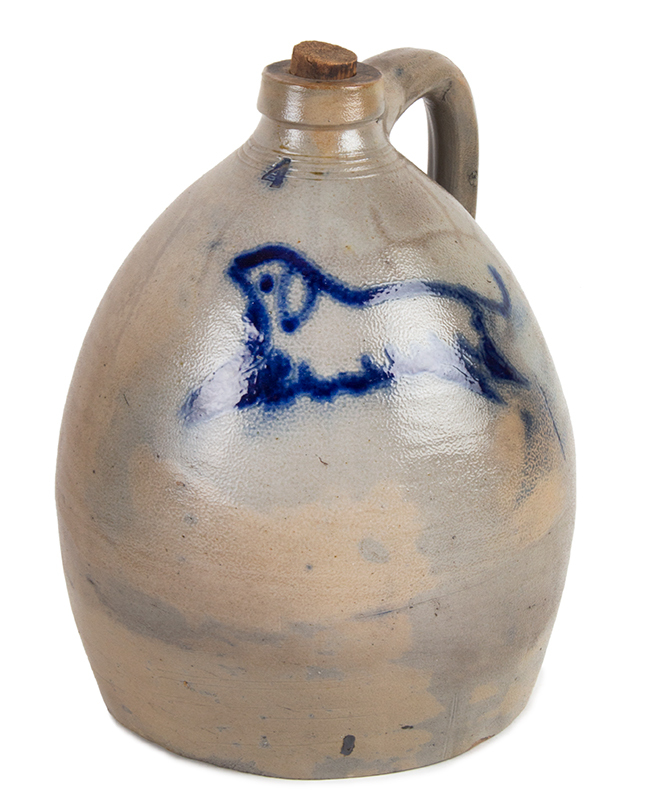 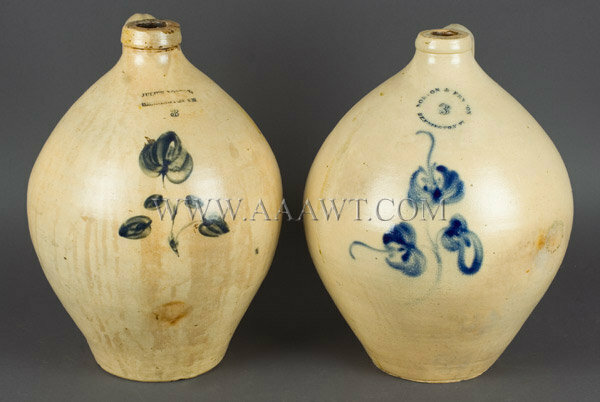 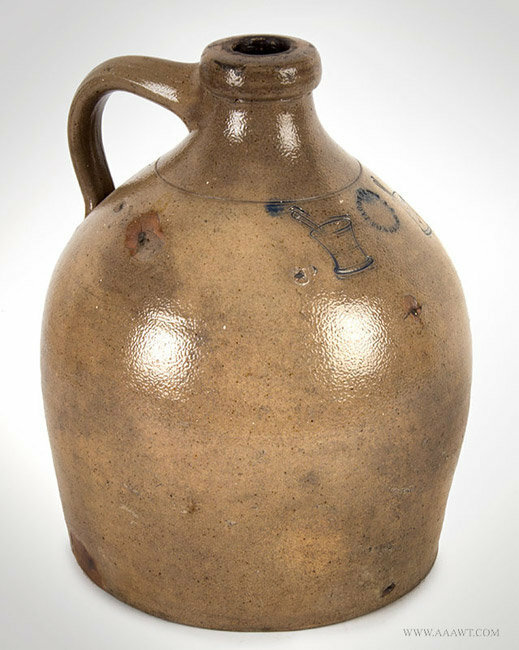 Salt Glazed Stoneware Ovoid Jug, Stamped "CHARLESTOWN,"
Three gallon jug with transparent brown glaze, tooled and incised neck, impressed "BOSTON" and washed in cobalt. 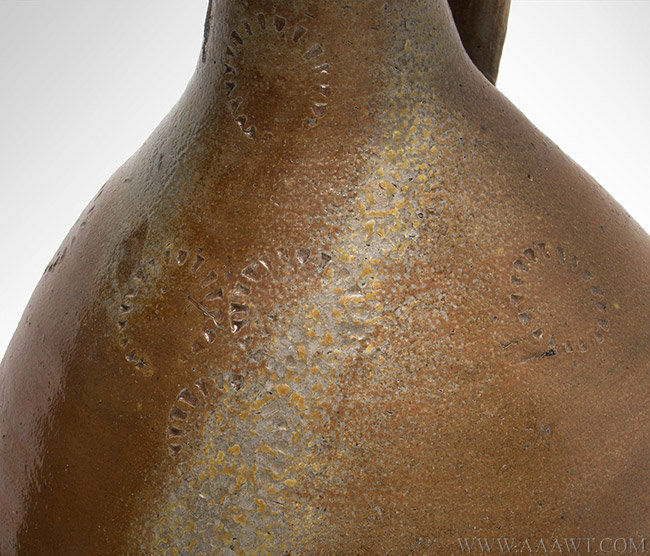 Approximately three flakes on base and one small chip on shoulder close to handle. 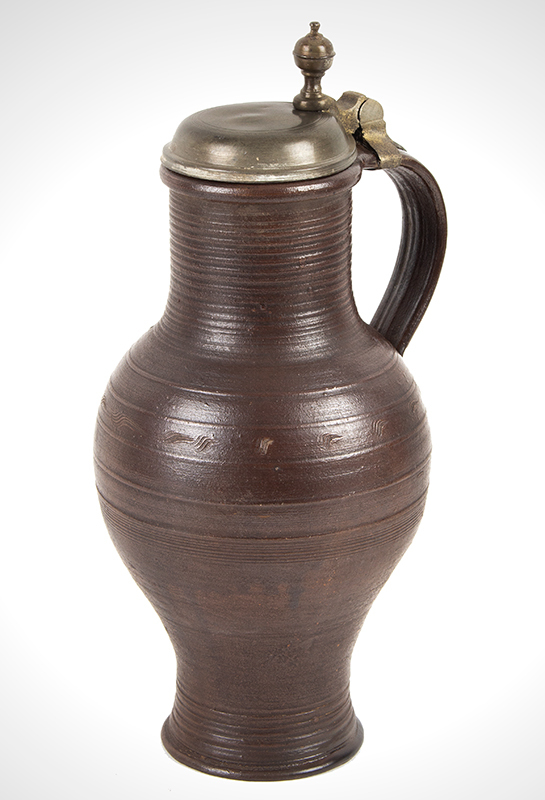 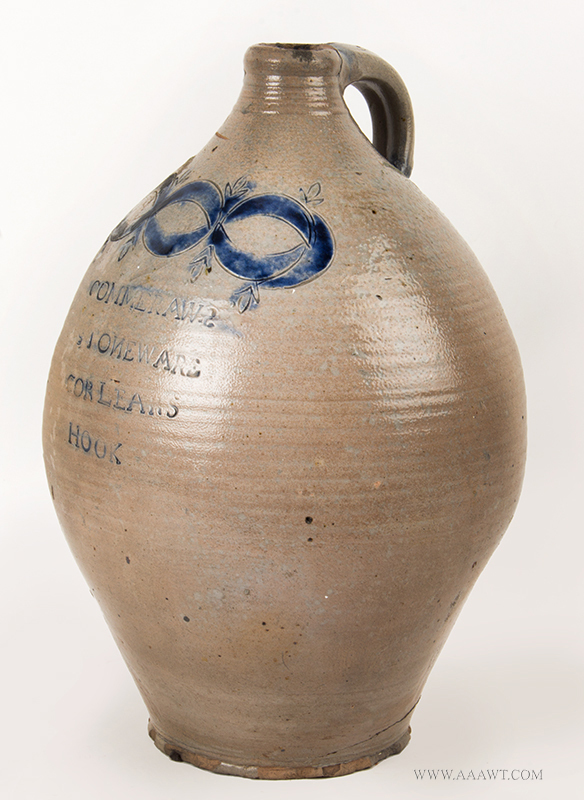 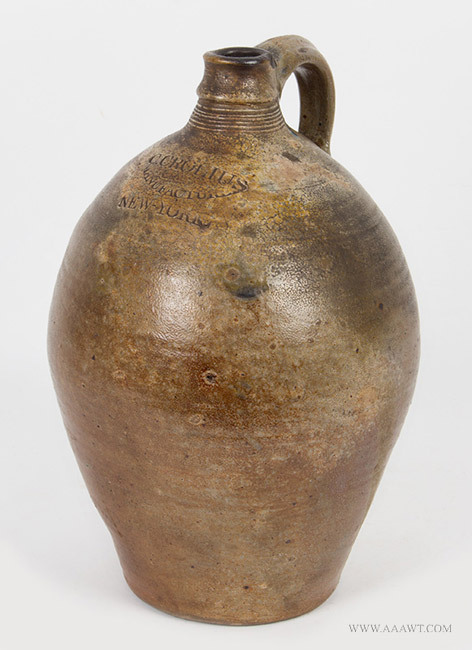 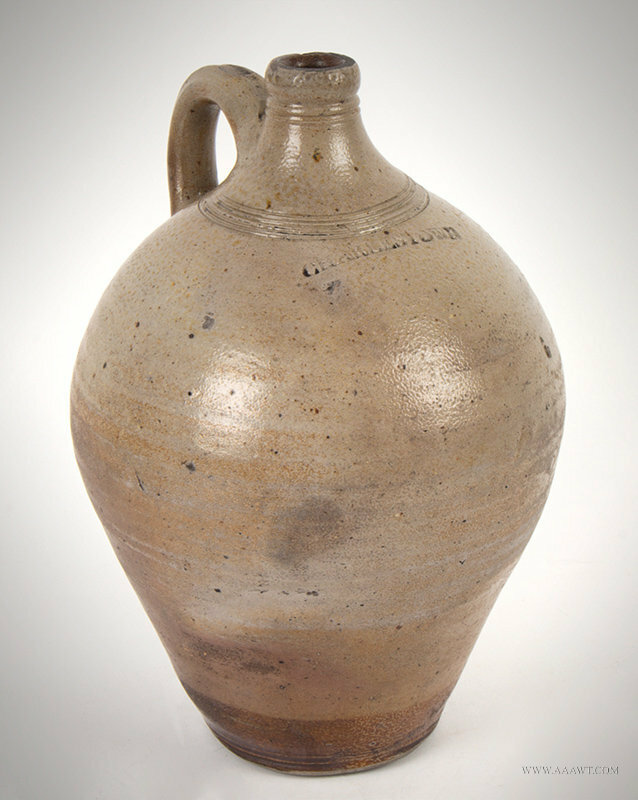 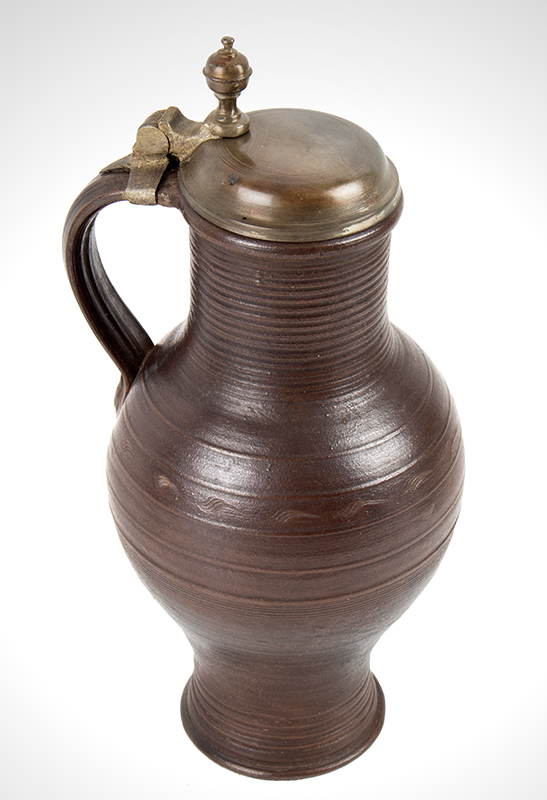 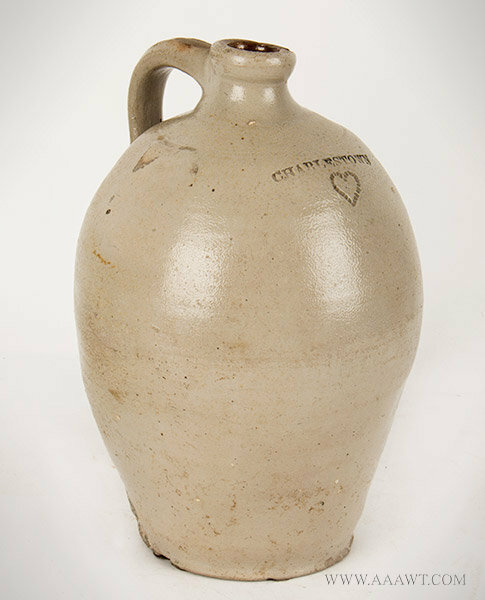 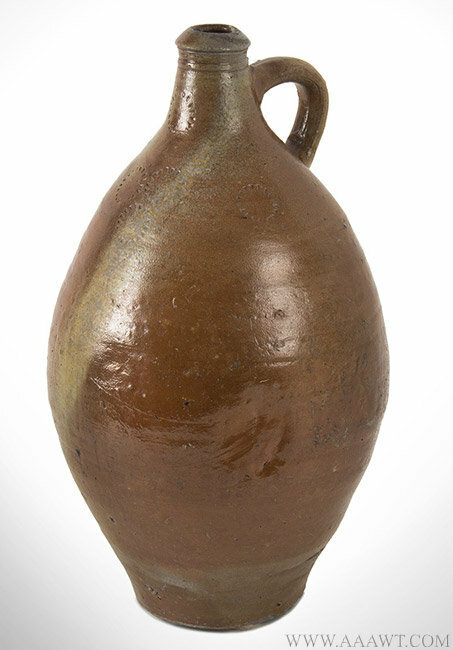 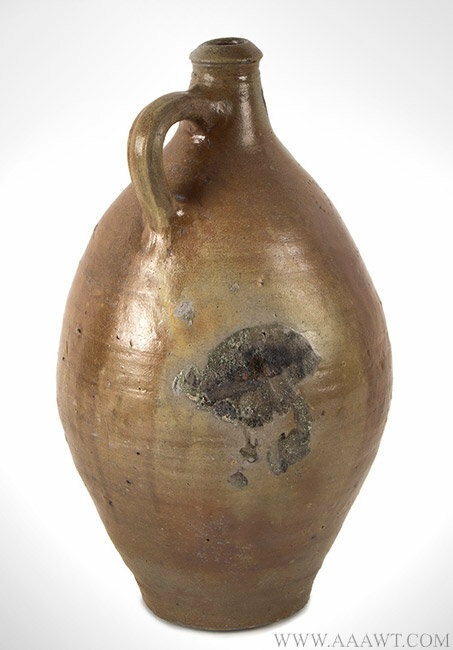 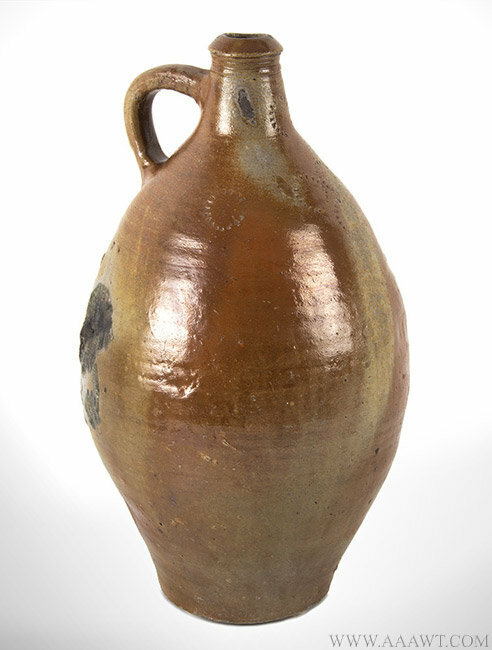 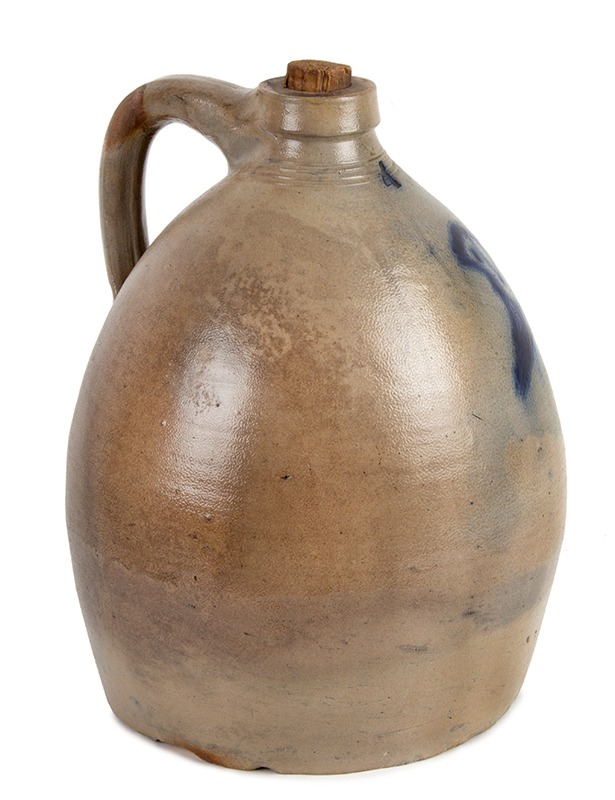 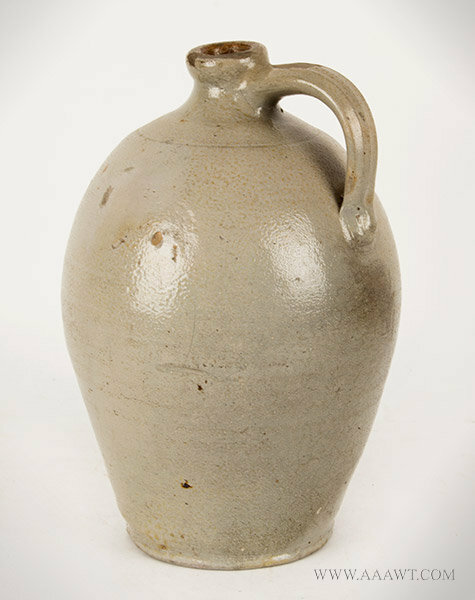 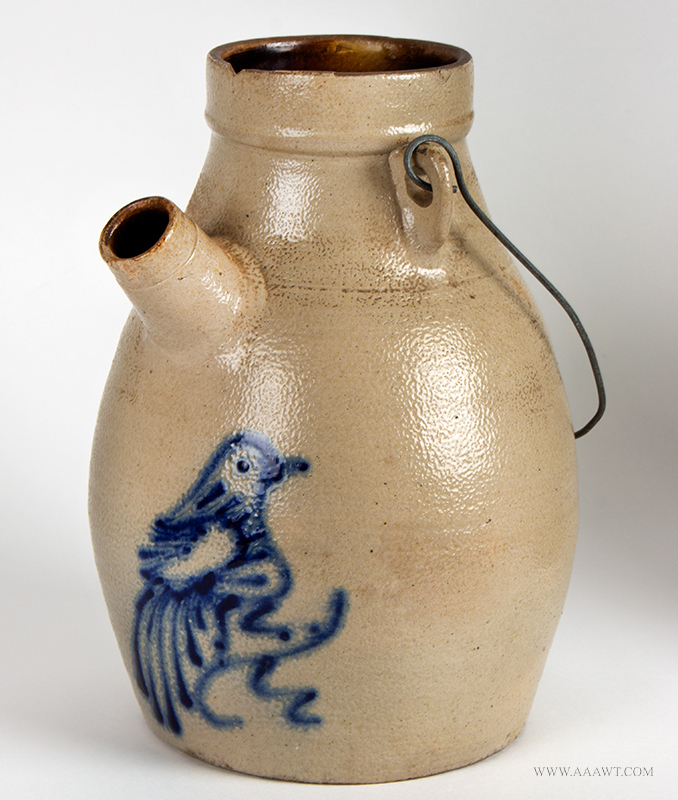 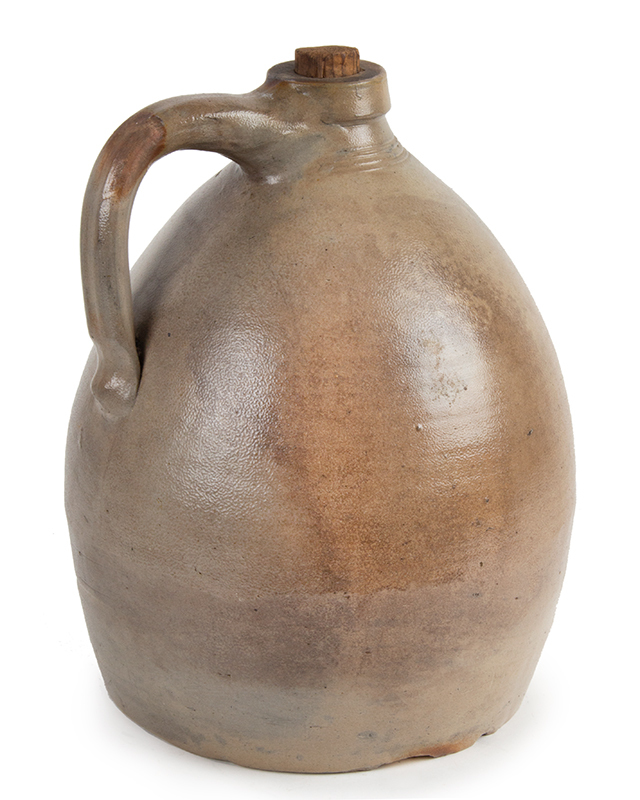 A "Charlestown" two-gallon stoneware jug. 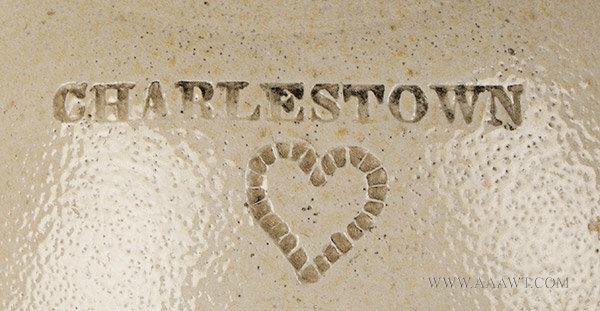 A swollen ovoid jug with reeded neck and base, and applied ridged handle, the shoulder impressed "Charlestown" in capital letters above two impressed hearts to indicate gallon capacity. 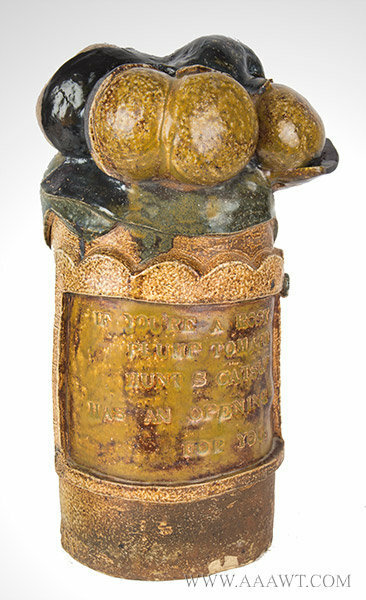 Brothers Joseph and William Hunt incorporated their company in 1890 as the Hunt Brothers Fruit Packing Company in Santa Rosa, California. 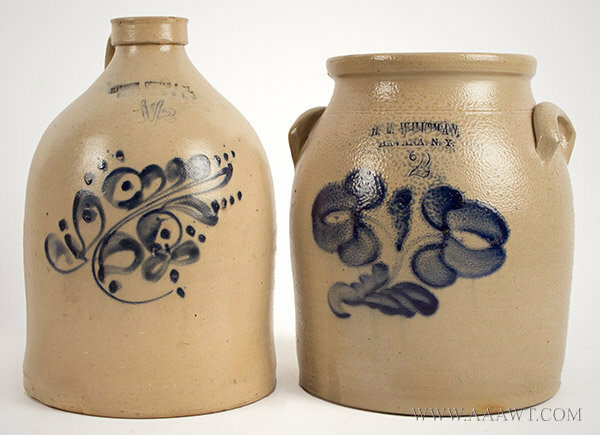 The date of this display is unknown but more than likely dates from the last decade of 19th, or first decade of the 20th century. 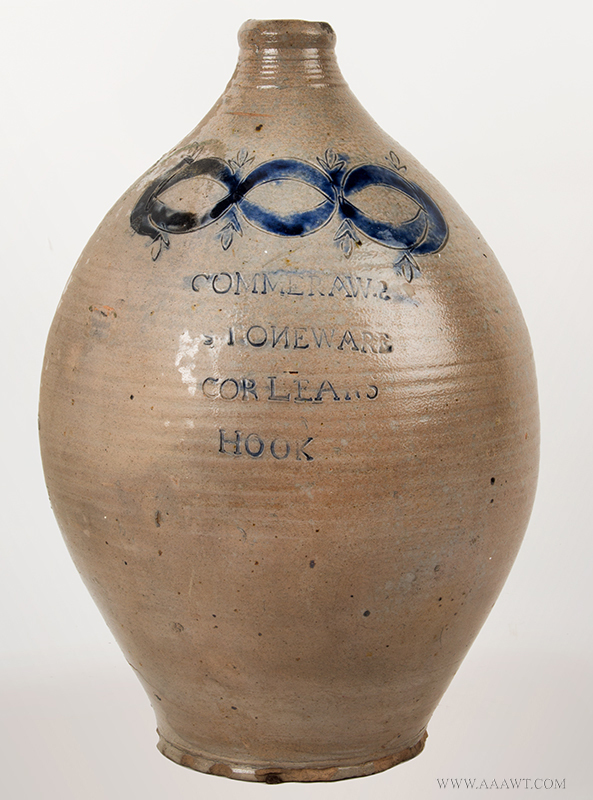 Hunt's used this slogan late as 1968. 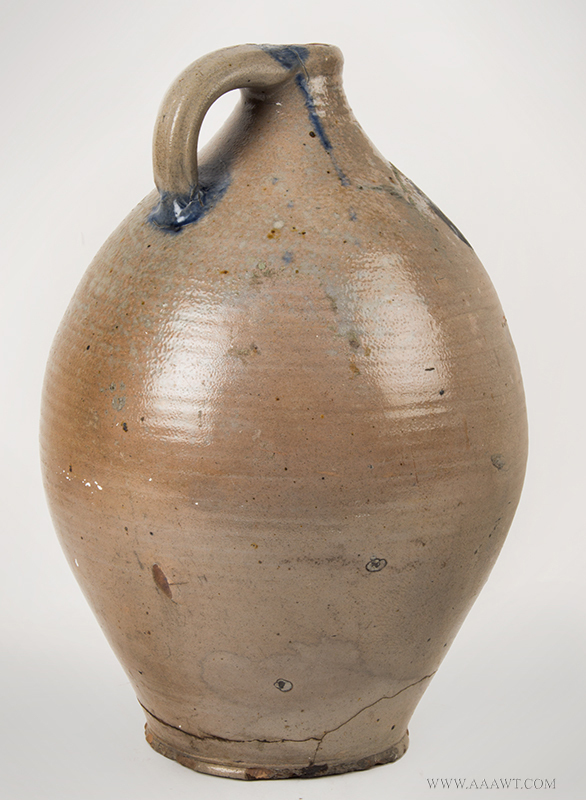 Few minor imperfections. 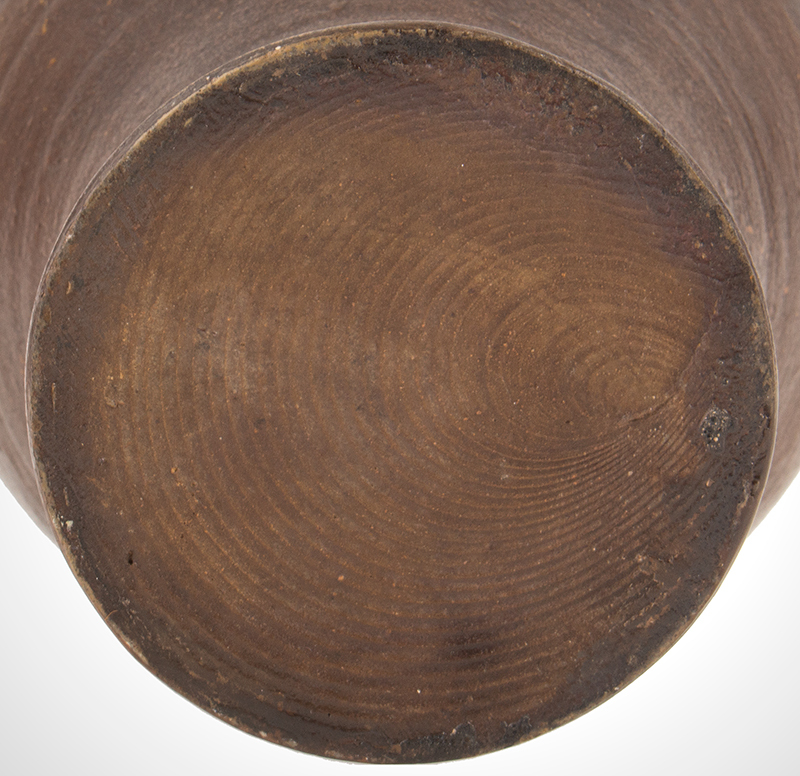 Dimensions: 11" H.
Staining as depicted, otherwise fine. 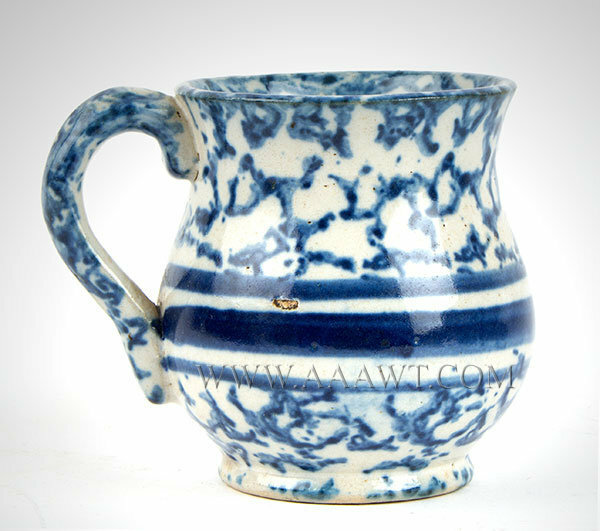 Highly ovoid, squared spout, few minor lines at base of handle, otherwise excellent. 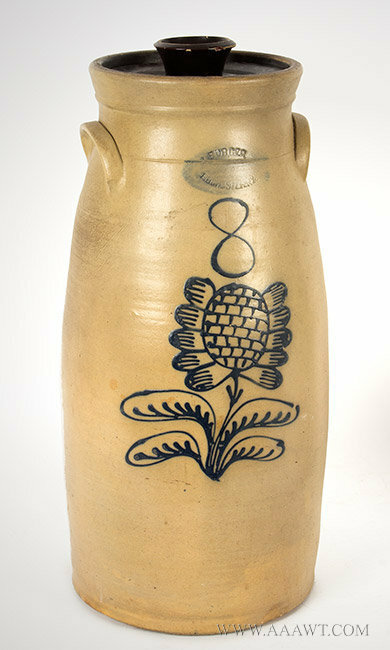 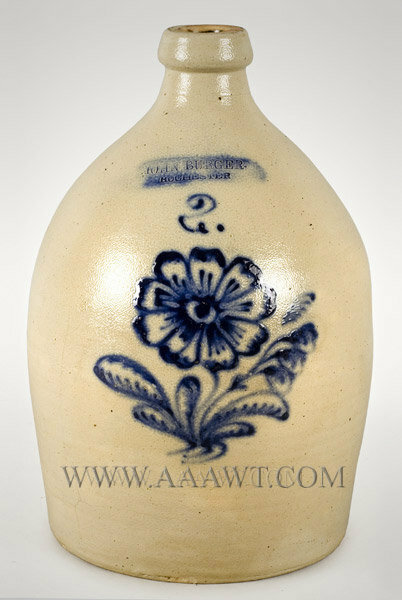 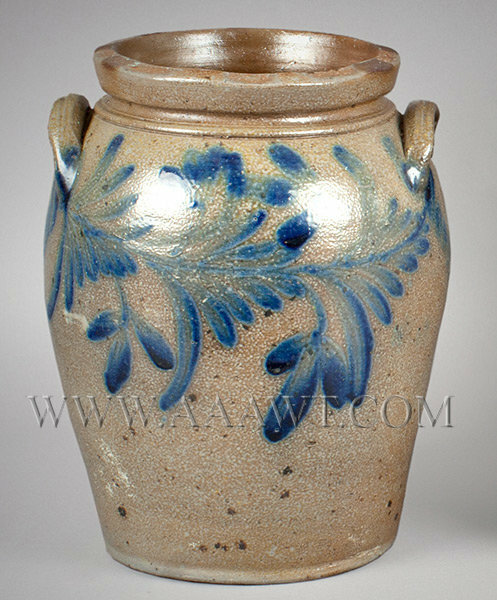 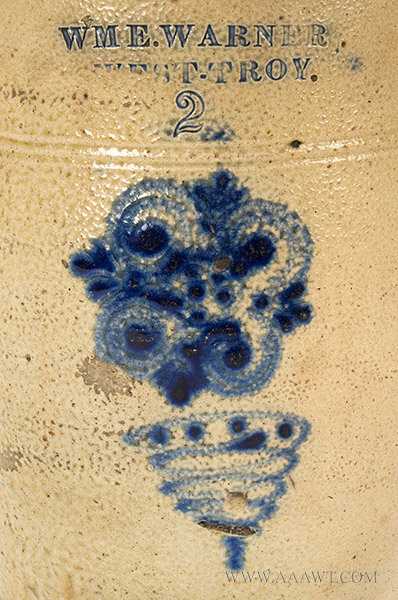 This ovoid jug with tapering shoulder and flatted tooled rim has lug handles and cobalt decoration; stylized cobalt floral decoration at midsection, "3" impressed near neck, brown glaze on interior, two chips on rim, no other chips or cracks, some kiln drippings and glaze "alligatored" on upper half during firing. 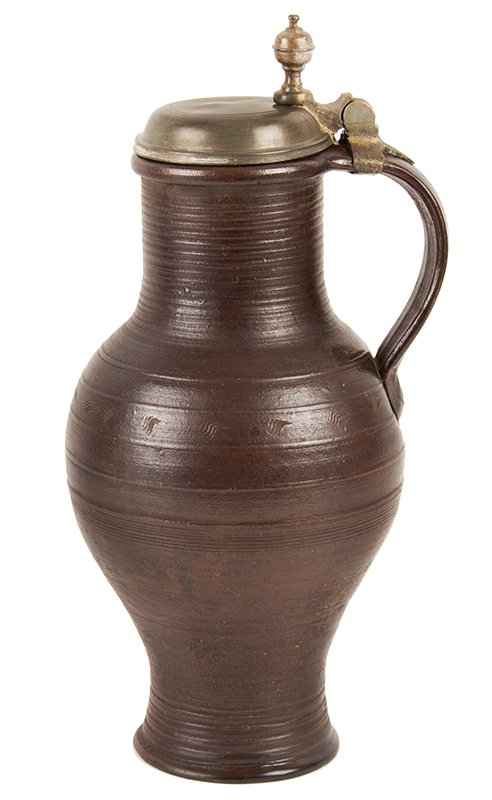 - Approximately 13-inches high. 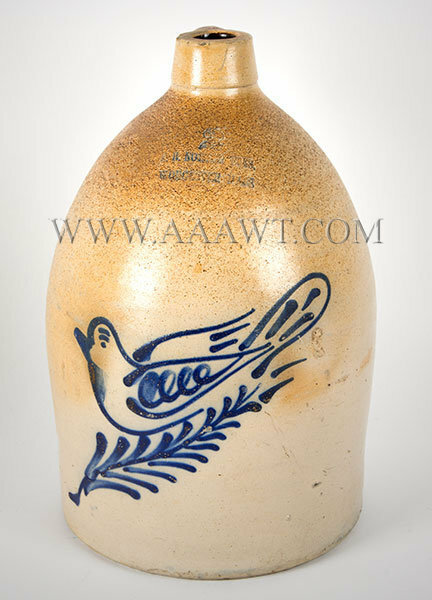 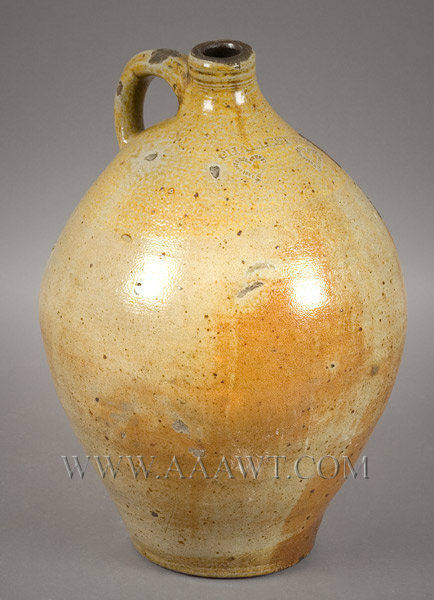 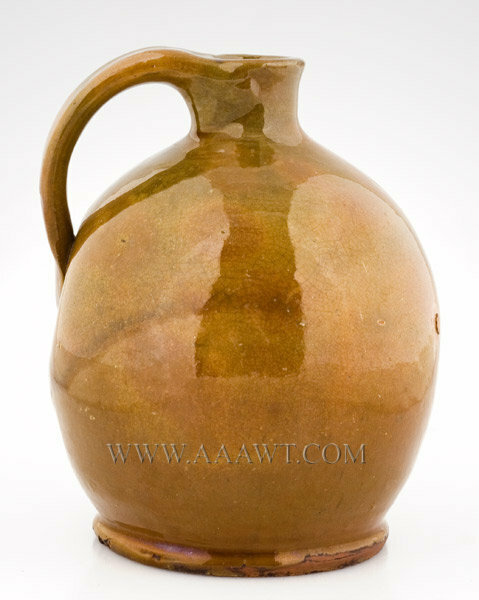 Cream color pottery handled jug, impressed on shoulder, 'John Burger. 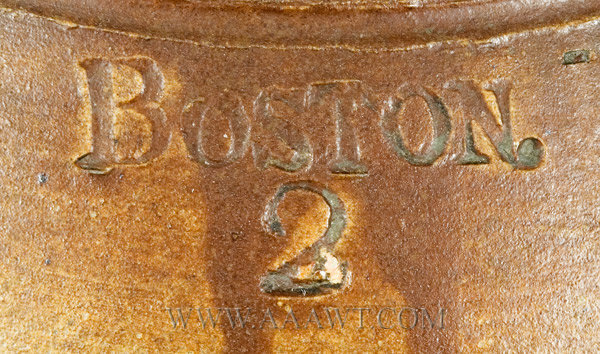 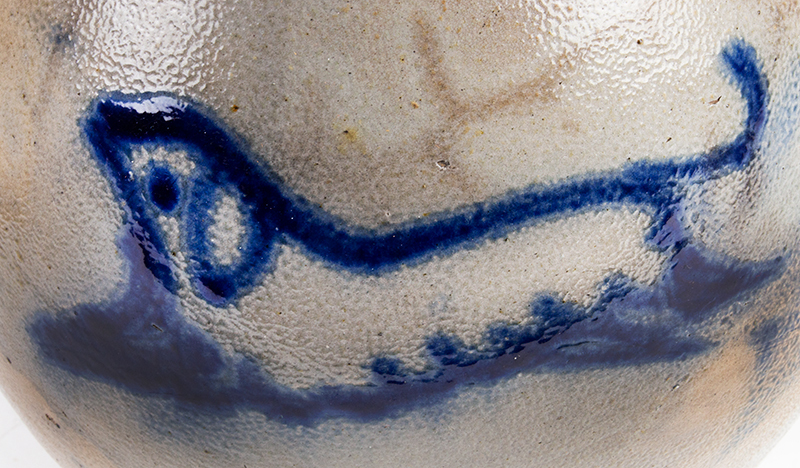 / Rochester', washed with cobalt blue; number "2" above stylized flower and leaf decoration. 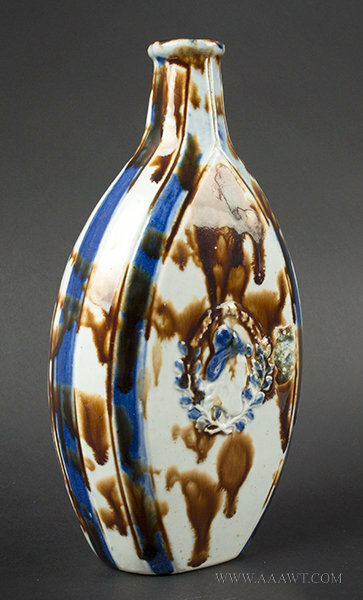 The deep blue and well executed decoration is typical of Burger's production. 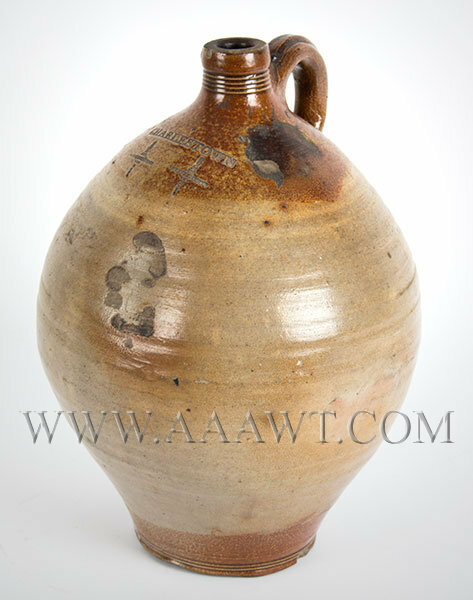 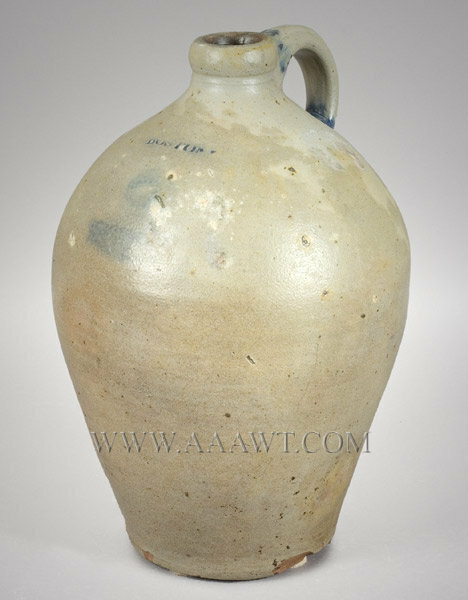 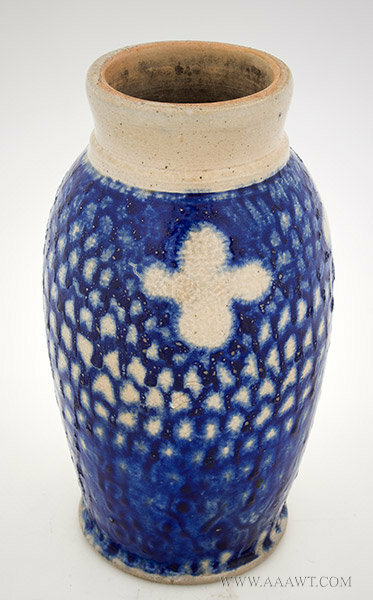 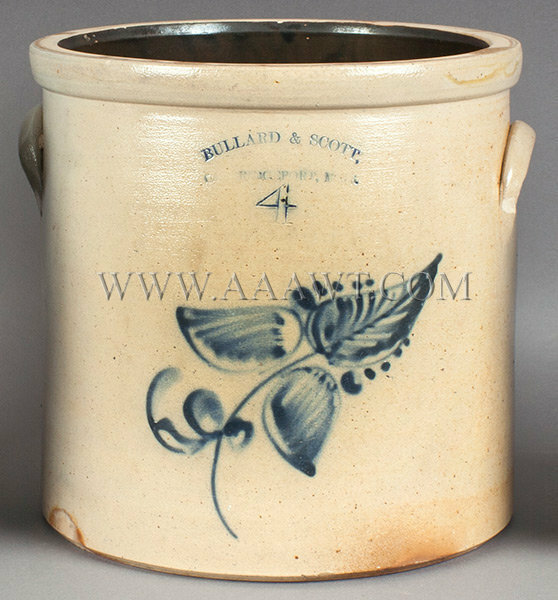 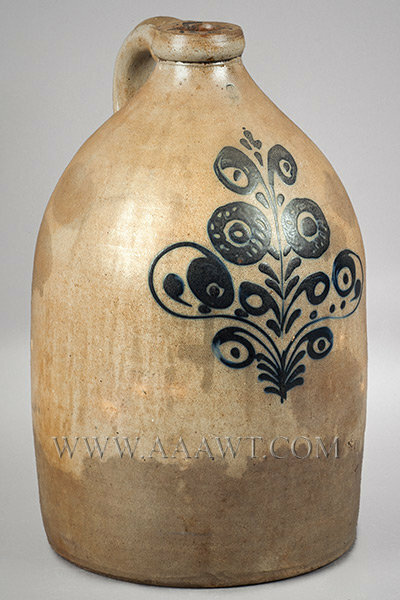 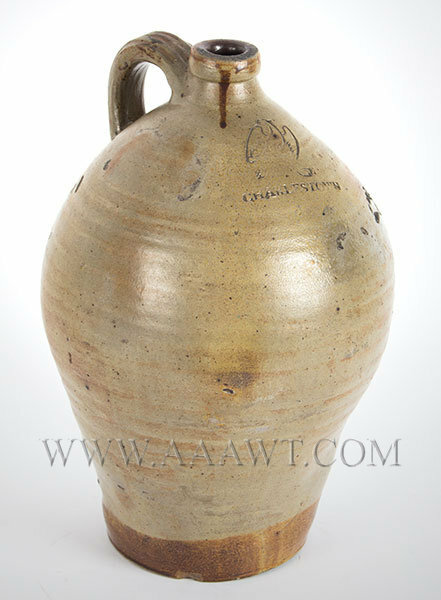 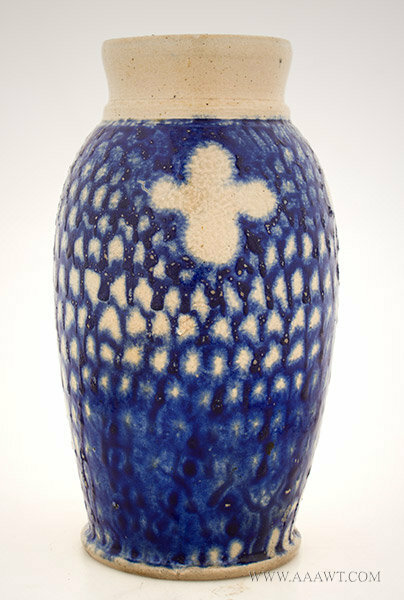 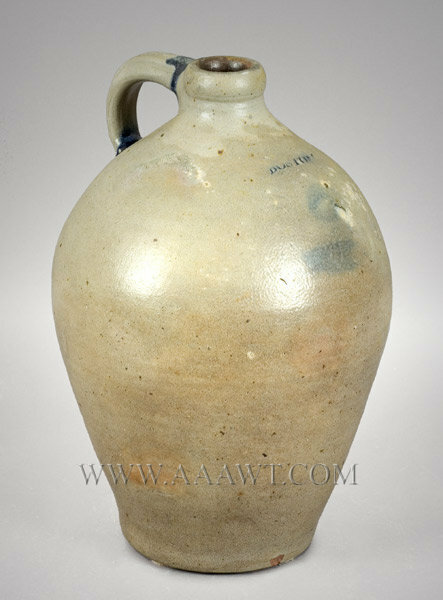 This two-gallon example stands at 14" and is in fine original condition with only a glaze spider on left side near base.